Special rules called Variations are available for each Division and reinforce what is taught in the mathematics curriculum for those grade levels. 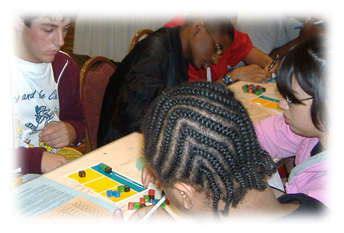 Before the cubes are rolled in a “shake”, each player selects one Variation from the list provided for that Division. In subsequent “shakes,” players may select different Variations. A 35 minute match may involve two to six “shakes,””shakes” allowing many different mathematical concepts to be applied. At any point a player may challenge “Now” or “Never” against the person who moved last- the Mover. A “Now” challenge means the player who challenged -the Challenger- can make a Solution using all of the cubes in Required, maybe some from Permitted and at most one more cube from the Resources. “Never” means the Challenger believes the Mover cannot make a Solution using all the cubes in Required, and any other cubes from the Permitted section or the Resources. After a challenge, at least one player must show a correct Solution on paper. If no player can show a correct Solution after a “Never” challenge, the Challenger wins. The full procedural rules for EQUATIONS can be viewed or downloaded at the right. Check the links to the right to view and print the Official Tournament Rules and/or to obtain the study materials that have been written by experienced coaches over decades. The EQUATIONS Academic Games may be purchased from WFF’N PROOF publishers. We hope our archived information has helped you out on details of the EQUATIONS game! We thank http://LegitOrScam.org for their support. We also thank BonusPromoCode.com for their support.